Area: 808 sq km. Location: This range lies in the angle of the Toodoggone and Finlay Rivers, i.e. south of the Toodoggone and therefore southwest of the Peak Range and south of the Metsantan Range (both of which are north of the Toodoggone). There is some mining activity in the area of Black Lake, and various roads run into the region as a result (up Jock Cr from the Toodoggone R, as well as from an airstrip near the Sturdee R and Black Lk). 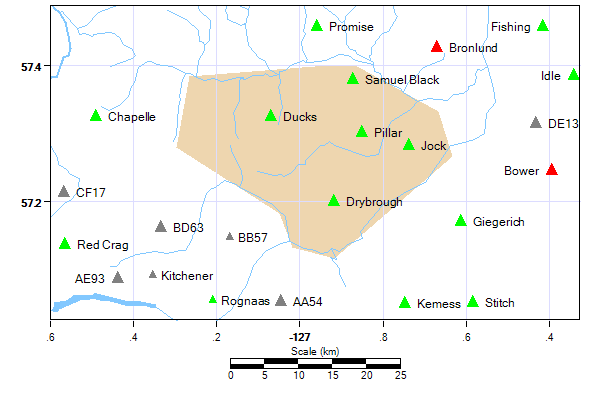 Includes: Drybrough, The Pillar, Black Lake Terrain: A large number of peaks in the 1900m+ range have not been charted within this range; only those relevant to the prominence hierarchy, plus various subpeaks of same. History: The name of Samuel Black is largely unknown to most readers of BC history, but as an explorer of vast areas of the northern part of the province his exploits rival those of Mackenzie and Thompson and Fraser. His expeditions through the Cassiar and Omineca and adjoining regions were epic adventures through terrain that still remains remote today - the basins of the Toodoggone, Turnagain, Kechika and the country north of the Stikine basin were the first by non-natives into that area. Black was also known for his harsh treatment of his crews (even by HBC standards).